The idea for White Coffee Pot Restaurants was born at the height of the Great Depression when Myles and Betty Katz bought 3 struggling restaurants in the Baltimore area. Their business plan was simple, great food at good prices and plenty of it. They soon became a hit with Baltimoreans who were down on their luck from the Great Depression and could get a full Thanksgiving Dinner for 75¢. This business model carried them ever higher on the waves of prosperity until in the 1970's there were 33 White Coffee pot restaurants in the Baltimore - Washington area. In the 1950's White Coffee Pot had bought the Horn and Horn Smorgasbords and merged the 2 companies building up the cafeteria style all you can eat buffets over the years. The 1980's however were the era of decline for White Coffee Pot. The company made more money off the smorgasbords than the intimate, service oriented White Coffee Pot restaurants. 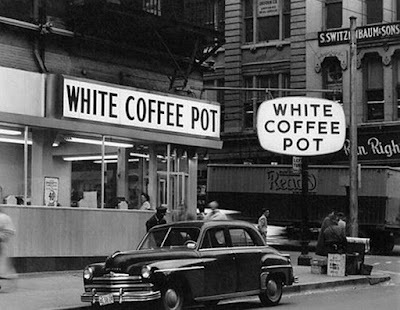 By the late 1980's the writing was on the wall and the parent company, White Coffee pot Family Inns, Inc, decided to close the White Coffee Pot locations one by one as the leases expired. The last one to go was located in the Brooklyn Park neighborhood of Baltimore and closed in 1993. While this was a long time in comping and planned by the company it is sad nonetheless, a reflection on the changing eating habits of Americans who rely ever more heavily on a fast food diet. Of all the dishes that were served at the White Coffee Pot restaurants it can be said the best 2 were the Maryland Fried Chicken and the Bread Pudding. 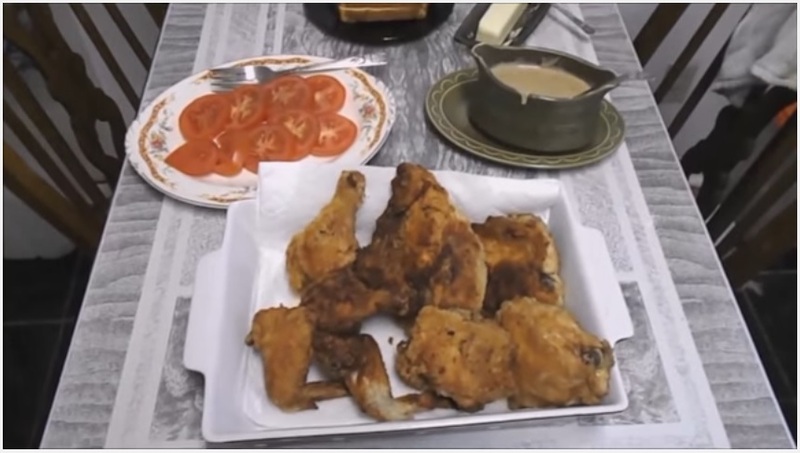 I already have quite a few recipes for Maryland Fried Chicken and they're pretty much all the same as what I am giving you here. It's chicken, dredged in flour and shallow fried until crisp. Covering the chicken during the first part of the cooking process allows it to cook through and an uncovered final cook gets it crisp. Lastly a pan gravy with all the nice browned bits incorporated finishes off this tasty dish. Set a heavy bottom frying pan on the stove over medium high heat and place 1/2" fresh oil in it to heat up. In a bowl mix together flour, salt, pepper and season salt. Remove 3T and set aside for later. Rinse the chicken in with cold water and while still wet dredge in the seasoned flour and immediately place in frying pan skin side down. Fry until browned, 2-3mins, then flip over and brown the other side, 2-3mins. Flip again then cover and fry 5 mins turning chicken once halfway through. Remove pan lid and increase heat slightly then fry chicken until crisp about 2 mins per side, reducing heat if chicken browns too quickly. Remove to wire rack over newspapers to drain. Remove oil from pan reserving 3T. Reheat pan and add oil and flour whisking to combine and deglaze the pan. When the flour mixture is cooked through, about 3 mins, add milk and whisk constantly until thickened. Serve with chicken. White chicken recipe is fantastic for all those dinner which you're functioning, at any time of this afternoon. Anybody who enjoys tasty foods are sure to love the white chicken cream recipe. This recipe is just one of their favorite recipe one of my relatives, on every single weekend I create this recipe to most them.Try this chicken white karahi recipe, this is quite easy to make at your home kitchen.